The most heavily-used phrase among in-house counsel and private practice lawyers alike is ‘trusted adviser’, so it is therefore unsurprising that this became the first major topic of discussion on an agenda looking at the key pressure points facing in-house counsel. Stuart Clarke, head of legal at Scottish Enterprise, says it is fundamental to be seen as being at the heart of your organisation’s thoughts on how it is going to deliver its business plan. Ramsay Milne, the company secretary of Scottish Water, observes that in-house teams appear to be getting bigger, which surely demonstrates that they are persuading the purse holders that lawyers have a substantive role to play. But the drive by in-house departments to offer value to their business means a company’s lawyers actually have to make an impact. ‘Provided that when you do step in and try to become involved you do a decent job, people are receptive and appreciative,’ says Andrew Farquhar, senior legal counsel at Skyscanner. Appetite for risk will depend on the type of business. Farquhar observes that for an established financial services business, which is much more heavily regulated, the appetite for taking risk may be less than somewhere like Skyscanner, which operates in the fast-changing internet landscape. But regardless, the conclusion is the same: ‘Whenever I speak to other people in-house, nobody wants to be perceived as a blocker,’ he says. Aligned to value and inextricably linking in-house and private practice is the ‘more for less’ agenda that has been a feature ever since the global financial crisis. It is clear to all around the table that the way general counsel are engaging external legal services is changing as the marketplace consolidates and as alternative providers come in. 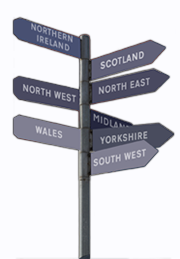 Clarke says Scottish Enterprise works with a framework of four law firms and has helped support the growth of Ashurst and NewGalexy in Scotland, bringing business that would otherwise be serviced overseas to be serviced in Scotland. ‘Those change pressures – more for less, technology, deregulation – as they increase we will still see huge change. 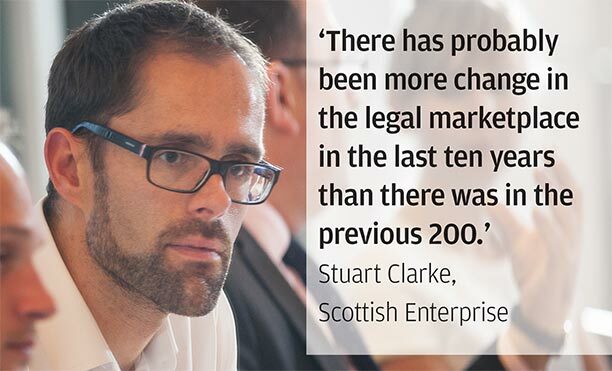 There has probably been more change in the legal marketplace in the last ten years than there was in the previous 200. In our organisation and beyond, we are seeing much greater teaming up between lawyers in-house and external lawyers as part of project teams, multidisciplinary teams where everyone has a clear idea about who can contribute value, where, when and how,’ he comments. 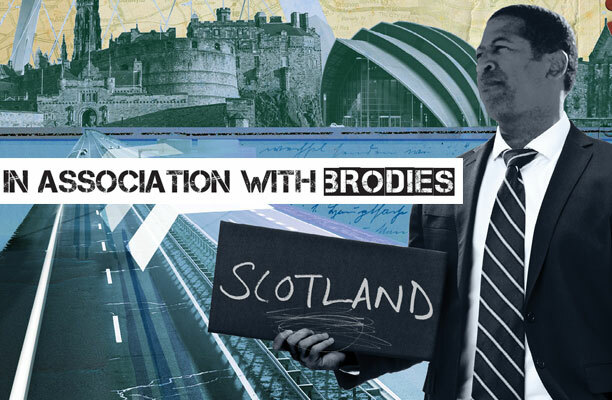 Cullen responds that the partners at Brodies know they have to be able to work in the same way as legal processing companies would for their clients and cannot just put a team of lawyers onto something that paralegals could do, charging the normal rates. The suggestion, however, is that the Big Four accountants have been able to make much larger investments in technology that allow them to disrupt the markets they are operating in and they can only do that because they are prepared to make large-scale investment – something that the legal profession has been unable or unwilling to emulate. This point led to a discussion over how in-house lawyers put a price on the value that is being offered by their external lawyers. Milne says that the problem often comes when working with the procurement functions in business, who cannot believe how expensive lawyers are or why they are so much more expensive than they were five years ago. Jonny Clark says he has plenty of experience of working for utilities and having these sorts of conversations with their procurement teams. His approach has been to stick to his guns. ‘You either get the job done right once or you can get the job done very badly several times and it will cost you a hell of a lot more money,’ he argues. Finally, the main topic of discussion was a desire among the in-house community to be better represented at board level. McIntosh observes that in the UK in-house lawyers are under-represented on boards compared to the US. Derek Francis, an advocate at Terra Firma Chambers, argues that having internal lawyers too close to the business is not necessarily a strength, as their view of law and business is tainted by wish-fulfilment. Having external lawyers as an ear and as an adviser to the business means distance and objectivity. ‘Do not get me wrong, I am not suggesting that there are no in-house lawyers that can bring to what they do the same objectivity as the person who is the hired gun. What I am saying is that it is a hell of a lot harder,’ he says. But Clarke gives examples of himself leading successful projects for Scottish Enterprise and cites Annemarie O’Donnell, who has just become chief executive of Glasgow City Council, who came up through its legal team. Either way, Milne argues, you have to get away from the lawyer’s mindset.